For a long time I have been writing task lists. I constantly re-write them as I have to re-prioritise, and as they also get messy with crossed out jobs. I then came across the Unfolder wallet organizer by Andrew Durham and adapted the idea for my own use. I created two separate versions, one for my desk, the other to carry on a belt. The basic idea is to create a slip of paper for each task or idea and then place it in order of priority or category. I made the desk organizer about 15 years ago, and it has served me quite well. I quite liked the idea of a bound organizer of the type one can buy in shops, but not at great expense and one which requires dedicated paper (also purchased at great expense), so I made one with a standard ring binder mechanism, and sized it to take A6 paper. That way I can use up old A4 letters sent by all those less than thrifty organizations or companies, writing on one side of the paper only. I just guillotine it into four and use a standard hole punch. So simple. And I have not paid a single penny on replacement paper. The task list was just a piece of paper with the next most important jobs listed on it, always having to be re-written. The loose slip list has revolutionised my time management. I made two card inserts with strips of thin card glued on, forming little pockets into which I can slip the strips, and then remove each slip as the job is completed. If circumstances change I just shuffle the list into a new order. I also glues thin card spacers between the main card and the strip of card, so that the pocket will take several slips of paper, otherwise the pocket will be too tight. To be realistic in what I can achieve in a day (and not get overwhelmed by a long list I made only a few pockets and only put a few jobs into them, the most urgent, of course, but also, for morale, I put in a few jobs I would really like to do that day. Below the photos I give the categories I use as inspiration only, as you will probably have very different ways of categorising your routine. Quicky/Filler job - a small task, or one that can be done a bit at a time to fill time whilst waiting, maybe for the stew to be ready, or those few minutes before some scheduled task. I only just finished the loose slip list a few days ago, and am still fine-tuning the use. I may make deeper pockets for the weekly planner, and use thicker spacers to allow more slips to fit in. After the card inserts there is a diary with a few weeks for each page where I write down dated tasks and appointments, which will be transferred to slips during the current week. Then follows a year planner and a number of pages with categorised tasks, which move up to the loose slip list eventually. The rest of the organizer has sections with reference information like weights and measurements, birthdays, addresses, and my journal. I have made a similar organizer for all my computer tasks, as it requires an organizer all to itself. 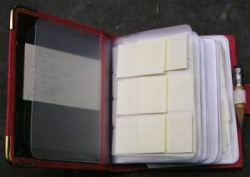 This is more closely based on the Unfolder with plastic pages holding sticky notes. I treated myself to a ready made credit card wallet with clear plastic inserts. 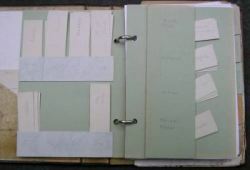 The advantage with this type is that the plastic pages are pockets which can hold loose slips of paper. The first page is for holding task slips as reminders when out and about, or list of tools to take to a job the other end of the wood. After that are several pages holding blank sticky notes on the outside for noting down diagrams, measurements or ideas etc. as they occur, which can later be transferred to their appropriate file, and also some blank slips inside the pockets for writing down tasks as I think of them. The second half contains reference material I may need when out and about, including telephone numbers. Some pockets are left empty for storing loose notes, maybe a telephone number given on a slip of paper or directions. Then a small credit card sized calculator, and some more blank paper, and finally I added an elastic loop for a pencil. Again, this is just for inspiration, and need not be rigidly adhered to.